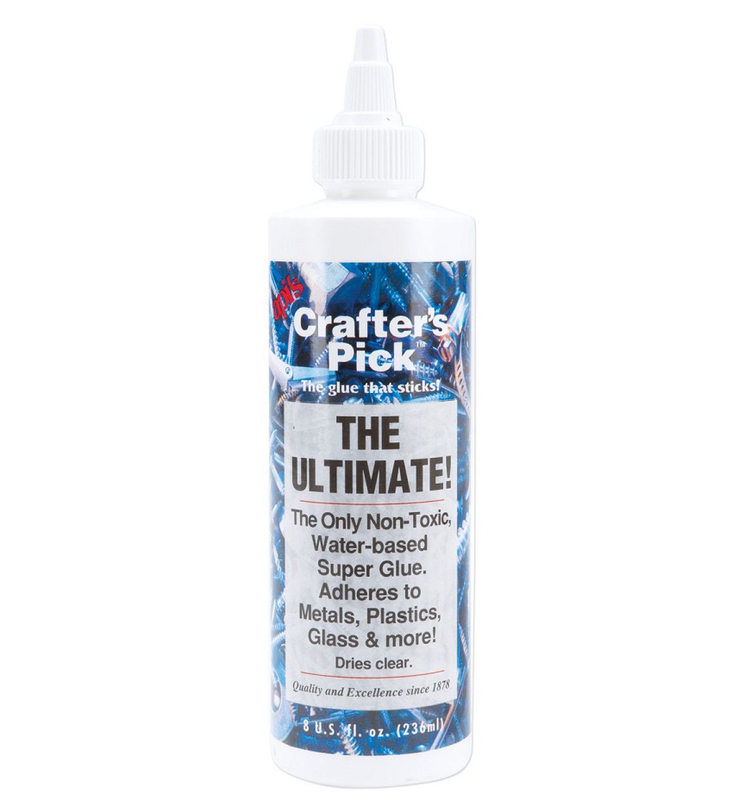 The Ultimate from Crafter's Pick is a unique new non-toxic adhesive which bonds to plastic, metals, painted surfaces and more! Usable as a liquid glue or as a contact cement! To use as a contact cement coat both surfaces, allow to dry clear & press together. This is the best craft glue! It stays slightly flexible so it can be used to reattach broken plastic pieces on toys as well as attach paper or embellishments for scrap-booking and making greeting cards. My 5 year old grand daughter thinks I can fix anything due to "The Ultimate" Crafter's Pick. A tiny bird broke off a Tinkerbelle house we got at Disney World and I was able to reattach it, a toddler was visiting her house and got in to her dress-up clothes and pulled a section of sequins and beads off a head band and I was able to glue them back on, and a hand-me-down princess dress was coming apart and I was able to glue it all back together even where the fabric had frayed. I like it better than super glue because it does not get brittle so it resists breaking. The only GLUE you really need! I use this in place of hot glue (which pops off in hot weather), E6000 (which smells and is toxic), Elmer's glue (which doesn't hold stuff all that well), and Aleene's Tacky Glue. The only thing I don't like about this glue is the container, so I buy a big bottle and pour it into a little jar and use it from the jar! 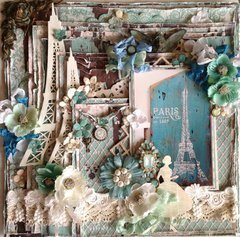 My students love the stuff because it holds even the bulkiest embellishment in place and sets up really fast, and dries clear and matte so if you are not too tidy, you never notice the drips. You can apply it with a toothpick, a finger, a credit card and a brush and wash it off all of it (before it dries) with soap and water. No odor, non-toxic--what more can one ask?! I have every kind of adhesive there is, I think. I am a glue junkie. This is by far the best wet adhesive I have seen for just about anything. I used it on metal tins, glass, beads, glitter, paper to paper, ribbon and it works like a champ. Dries really quickly and it pretty tacky from the get go. I didn't have to hold the paper down for very long to get a good stick. For the price, you cannot go wrong. Buy this! this product is amazing!! 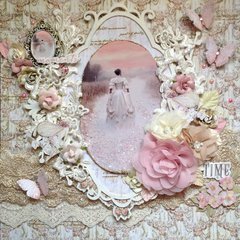 i would glue everything down with it if icould! i use it for flowers, really hard things to glue like heavy metal tags, fibers, ribbon, anything!!! i use it on projects that require that lil more sticky and heavy duty glue! and this does the job. when it says ultimate thats what it really means there is no limit to what u can use this glue for! its also great for glitter to make that 3-d look. 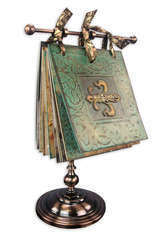 i am so glad yall carry this its a great thing to have for crafting and scrapbooking! its a must have!! hope yall use it as much as i do! WOW!!! This stuff really is "The Ultimate"!!! I loved this product the moment I first used it, and I just found a reason to love it even more. I had a little bit of trouble with my bottle. I am not sure whether it had sat at my LSS or what, but it got thick fast. But fear not...since it is water based I added a few drops of water to the bottle and "voila". It is perfect once again! And boy, does this stuff hold!!! I am working on some acryllic projects and I don't know what I would do without this stuff! 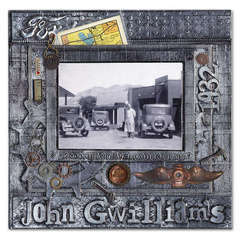 Metal, acryllic, wood, paper. It does it all! I've found Crafter's Pick glue to be one of the best multi-purpose craft adhesives I've ever used. It's not failed me yet. 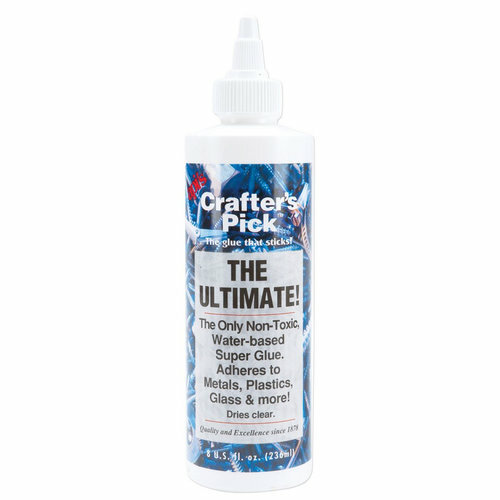 I recently sent a few bottles to some friends because they were having problems with the adhesive they were using on a project they were working on and I knew that Crafter's Pick was the solution. This is a very versatile glue. 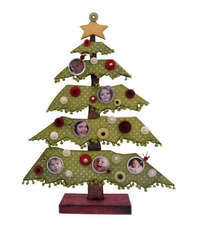 You can use it to attach buttons, chipboard or any other "bulky" items. You can also use it for book binding or anywhere where you need a strong, permanent glue. This is the only liquid glue that you need. This is one of my absolute go-to products for any gluing that is to be done. The bond is amazingly strong, and it dries perfectly clear. I have never run across anything that it won't hold in place. It is the ULTIMATE glue! Use a bottle with a tiny metal spout. 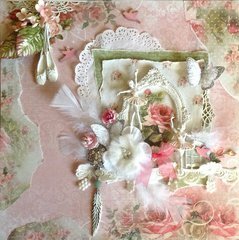 Mix water with the glue in the bottle until it is the consistency that is perfect to apply to your card making projects. No more having to apply with a toothpick! Product arrived in good time. Too thick and difficult to use. I was wondering how long it takes to dry. Is it as quick as hot glue or Tombow Mono? By: blubonnettx (20-Mar-15) Helpful Question? Yes | No Thank you! Report Inappropriate This question has been reported. Thank you! It will take longer to dry than hot glue. By: Paula K (27-Mar-15) Helpful Answer? Yes | No Thank you! Report Inappropriate This Answer has been reported. Thank you! Can it be used for foil flakes? By: User (07-Apr-19) Helpful Question? Yes | No Thank you! Report Inappropriate This question has been reported. Thank you! Is it stringy like hot glue guns can be? By: abcande (30-Jul-18) Helpful Question? Yes | No Thank you! Report Inappropriate This question has been reported. Thank you! Not at all! It’s the BEST glue! By: RobinKirk (31-Jul-18) Helpful Answer? Yes | No Thank you! Report Inappropriate This Answer has been reported. Thank you! Does this dry mate. ok it drys transparent . Is it a shiny transparent dry or a mate transparent dry. Thank you. By: User (29-Jan-18) Helpful Question? Yes | No Thank you! Report Inappropriate This question has been reported. Thank you! This dry transparent By: olushka (05-Feb-18) Helpful Answer? Yes | No Thank you! Report Inappropriate This Answer has been reported. Thank you! How many ounces is this bottle? By: WABBITT (09-Dec-14) Helpful Question? Yes | No Thank you! Report Inappropriate This question has been reported. Thank you! It comes in more than one size. The bottle I have now is 8 oz. but I may have bought it at Hobby Lobby. I can't magnify the picture on this website enough to be able to say it is that size. It also comes in 4 oz. bottles. You might be able to tell by checking the price on other sites. By: path785 (10-Dec-14) Helpful Answer? Yes | No Thank you! Report Inappropriate This Answer has been reported. Thank you!